We finally get the youngest Barrett’s book and I have been anxious to find out more about Mac Barrett. Mac Barrett hasn’t been back to Scarlett Falls in a long time, especially due to his horrible past. The main reason why he’s heading back is his father, the Colonel, is dying. Although, he also has a reason to leave the area he was at due to what happened. Mac comes back to Scarlett Falls, when it’s in turmoil. One woman has been found dead and Mac may have stubbled across the other woman who has gone missing. He’s about to team up with Stella Dane, one of the police detective’s on the case to find out what is happening in her town. These two together are amazing. They both are determined to find out what is happening in Scarlett Falls and capture the killer that keeps kidnapping women that are linked together. Stella is one tough woman and I admired her, especially with what happened in the previous story. I’ve always loved how Melinda writes strong female characters. Don’t even get me started with Mac. He was much different from his siblings. I finally got to learn about his father more too in Seconds to Live and how the Barrett siblings were raised. Mac was a fighter too and I really enjoyed reading his story. 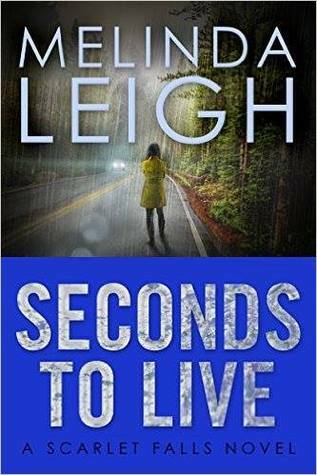 What I love most about Seconds to Live was Melinda Leigh kept me guessing on who the killer was. I couldn’t figure it out at all. I was just as clueless as Stella and Mac. I wasn’t expecting for the ending too. She knows how to keep me on my toes with the suspense. She also kept me intrigued with Stella and Mac. I love those two together. I can’t get enough of Melinda Leigh’s romantic suspense stories. She writes strong unforgettable characters with an amazing storyline. I give this book 5 stars and highly recommend it to Romantic Suspense readers out there.